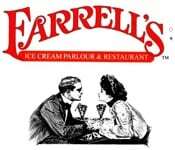 In 1963, Mr. Farrell opened the first Farrell’s Ice Cream Parlour in Portland, Oregon. It was immediately welcomed by guests and other parlours soon opened. By 1970 the company had grown to 58 restaurants. In 1971, Mr. Farrell was approached by the Marriott Corporation who subsequently bought the company. He continued to work with Marriott as the company grew to 130 locations nationwide. Under his watchful eyes, Farrell’s never experienced a restaurant failure.